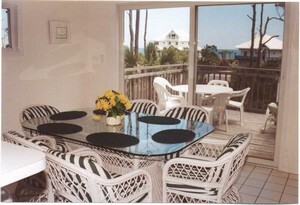 The Palms, FL beach house is offering Last Minute Rate for January 28-February 16. Advanced booking discount is available for Spring and Summer booking. The Palms Retreat is a spacious vacation home providing your family a fantastic view of the Gulf in a terrific environment in the private and gated Plantation neighbourhood. 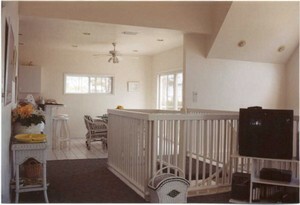 Upstairs, the kitchen, living room, dining room, and two decks provide a great place to enjoy a view of the Gulf. The two decks are furnished with an extra dinning room table, chaise lounges, and chairs. Catch the gulf breeze while snacking or reclining. During the day, these decks are perfect for sun tanning in privacy. 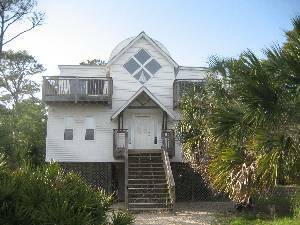 The Bayside screened porch on the upper level, furnished with the third dinning room table, provides a great place to enjoy any evening while surrounded by tall pines and palm trees. 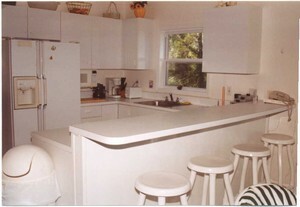 The large kitchen is completely furnished with dishes, microwave, pans, utensils, coffee maker, blender, toaster, etc. You can enjoy the view of the Gulf while preparing your gourmet meal in the kitchen. The upstairs has its own full bath and laundry area with washer and dryer. The living room is equipped with cable TV/VCR, stereo, and a pullout-sleeping sofa. Wireless high speed internet is available in the house. 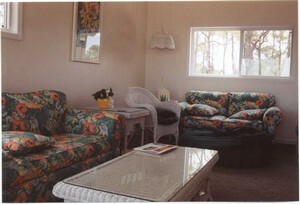 A second living area is downstairs and is also equipped with a cable TV/VCR. The downstairs has four large bedrooms, two baths, and the living area. Each bedroom is provided with a queen-size bed. The outside is also designed for your comfort: We have a fish preparation area downstairs that includes a large cutting table and water. Nearby is also a grill for your convenience. And when you come back from the beach, there is an outside shower with both hot and cold water for you to rinse off under. Also, two large cars fit perfectly under the house providing an escape from the sun for them. Our guests have access to the pools and tennis courts provided by the Plantations. Also, the sidewalks in the neighborhood are a great opportunity to jog, bike, roller blade, or walk. But one should never miss out on the splendor of the private beach of the Plantations that is just a short walk away. The sand is smooth, fine, and white making sunbathing, jogging, or playing on the beach spectacular. The island is also a great place to catch up on your fishing, either from a boat or the coast. Bring your great catches back home and prepare them on the outside fish preparation area, and then grill them on the outside grill or take them upstairs into the kitchen. You can also visit St. George Island State Park, located on the other side of the Island for deep-sea fishing, bicycle rides, and the beauty of this unique place. Take a night off the kitchen and visit one of the great seafood restaurants, either on the island, or near by Apalachicola. Do not wait any longer! 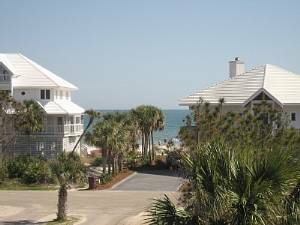 Gather your family and friends, and head to The Palms on St. George Island! We make sure that The Palms will exceed your expectations for a spectacular beach retreat. 10 min walking distance from the house. This channel, which separates St. George Island from Little St. George Island, is known for being a great spot to catch flounder. Enjoy the great view of a gulf. We arrived about dark on Saturday and found the house clean and welcoming. The house is light and airy with views of the gulf from the front porches. Nice private screened back porch as well. House is situated steps from the beach, and about half-way between the Plantation's pool and Bob Sykes Cut. A quiet getaway, just what we needed. We will definitely return. We had such a great vacation. Thank you, The Palms! -The house is surrounded by lush tropical vegetation-it is so beautiful! -The house has open floor plan-it was great for our extended family! -The house is clean and well maintained-this is always important for our family! -The Gulf view from the second floor is awesome! -The short distance to the private beachis is really short, only 2-4 minutes. -It was easy to work with owners. We also were impressed when we received our security deposit in 4 days after we left the house. We are planning to be back. We just back from the Island and The Palms. We loved the both. The Island is very unique and the house was very comfortable for our extended family and very convenience located. The beach was closer than we expected, Bob Sikes Cut was in 10-15 minutes walking distance. The Gulf view from the second floor is amazing. We also were impressed how fast we got our security deposit; just in 5 days after we left the Island. We already missed the Island, The Palms and the beach. My family and I visited the Palms on multiple occasions. Any time of the year, the experience is marvelous. During our recent visit in January we were escorted by dolphins on our kayaking trip. What could be more magnificent? The bikes provided by the house provided for great afternoon bike rides to the island's center. The one minute walk to the beach made watching sunrises on the beach easy. The island is a magical place and we The Palms provides great opportunities to experience all of it. Absolutely great vacation! The Island, the house, the plantation, the beaches, the gulf are amazing!!! 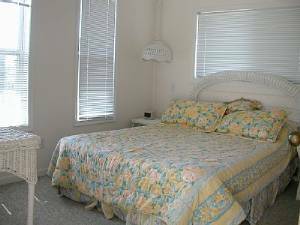 The house has very comfortable settings, very close to the beach and well equipped. We were very pleased to find wireless DSL internet in the house. Our teens were happy to ride bikes which were available for them in the house. The Plantation has great bike trial and we felt very good to let our kids to ride bikes by themselves around, because it is a gated community. Very good choice for the family vacation!!! We discovered St George Island this year. And everybody in our big family was pleased with this discovery. The island is very peaceful, calm, not crowd at all and the serenity of this area is amazed. It is also a very safe and family friendly environment. This is what we have been looking for years. We loved The Palms vacation house where we stayed for our vacation. The view of the gulf is absolutely great from the house. We had a very short walk to the beach, just about 2-4 min. The house has open plan floor with two living area on the first and second floor. It is a very convenience when you have a big family. 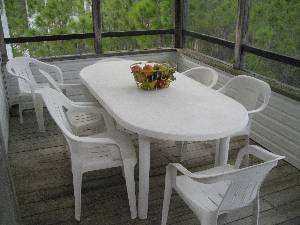 We liked to rest on two furnished decks during the day, but in the evening time we had a great time on the screened porch. The property was clean, well-kept, and well furnished. We certainly plan our next vacation in the Palms again. We LOVED our stay at the Palms! The house was comfortable & allowed privacy for all. The Island was great for bike riding. My husband grew very to attached to the mountain bike! We did rent bikes, but found the ones provided much better. Our dog, (don't let him read this) enjoyed the beach the most! It was his 1st exposure to it! My parents fell in love with the Island & the Palms. Thanks so much for the experience. We had a very good time at The Palms. We saw dolphins and collected seashells for good memories! We enjoyed everything, the house is more than beautiful and the island is gorgeous, we went swimming, fed the birds. It is the most relaxing vacation I have ever had .We thank you for the most wonderful time in St. George Island Florida. Deposit: $300 refundable security deposit. Other Fees: Linens-$60 If you have more than 8 people, please add $60 for each up to ten people. There is a pet fee if you would like to bring your pet. Please inquire.